Hello All, I have not been on here in a while or the garden for that fact. 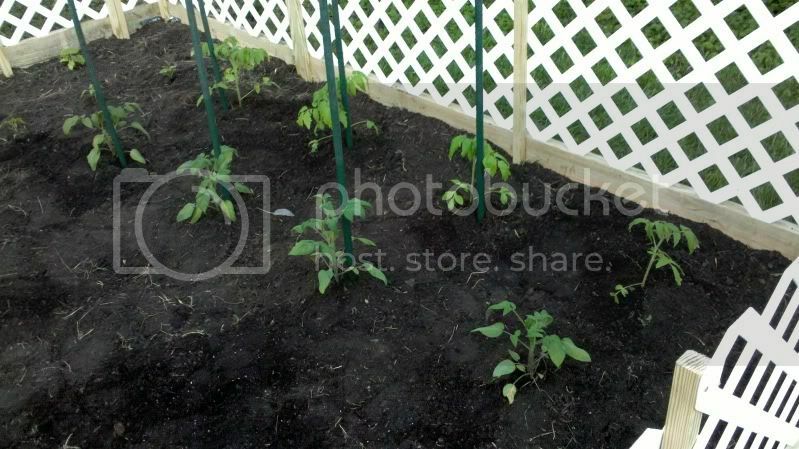 I moved from the last house where I had a very successful garden for the size that I had to work with and since I purchased the new home in June 2010 I have been too busy working on the house itself but have finally gotten my vegetable garden in! I grew all my veggies from seed in the basement since March. I am a little behind schedule but in my experience gardening in Maryland I should still get a pretty good harvest and healthy plants. 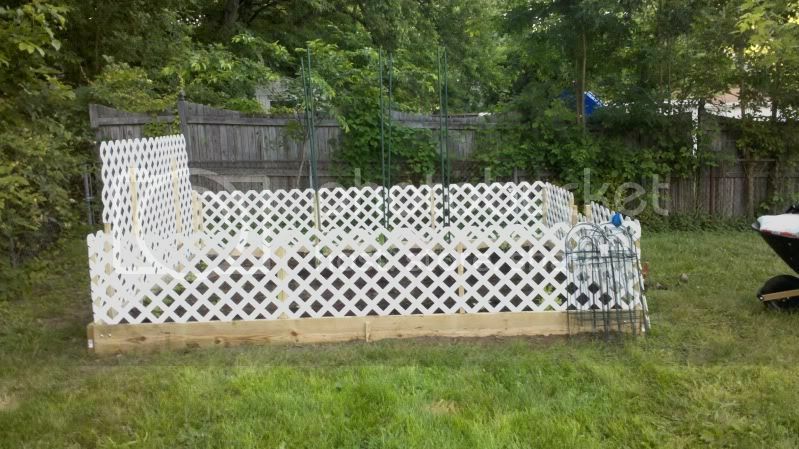 I did a classic/raised bed where I tilled up the earth built it up with 2x10s and then added soil and compost. 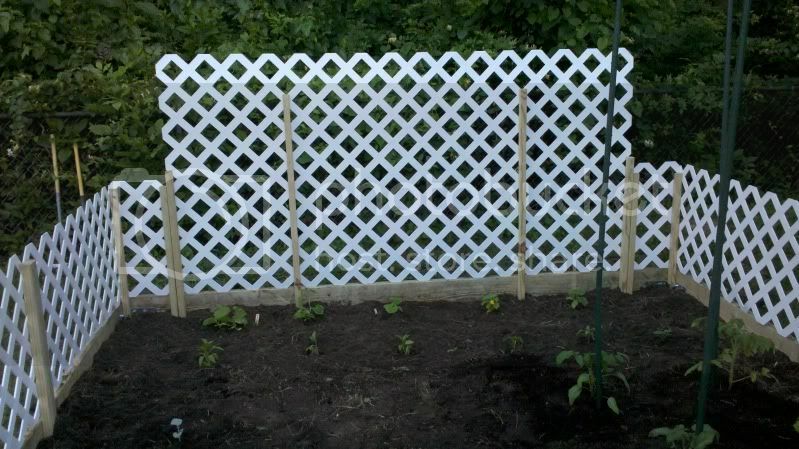 I then fenced in the entire garden with Lattice and created a higher lattice section in the back for my cukes. I have planted at the moment 4 Black Krim Tomatoes, 4 Pink Brandywine Tomatoes, 3 Mixed Bell Peppers, 3 Hot Peppers, 2 Broccoli, 5 Cukes, 3 Mixed Lettuce and will be getting my beans in soon. I plan on adding more beds like this for other veggies like onions, carrots, cabbage, and maybe potatoes one day. Enjoy the Pics and Happy Gardening to all! Your soil looks great. Nice and dark with a good bit of organic matter in there from the pictures. That should serve your plants nicely. I'm assuming the fence is to help with critters and to offer some vertical space for climbing plants. The only problem I see is that with raised bed gardening, the purpose of the raised beds is to allow the soil to not be walked on and packed down. 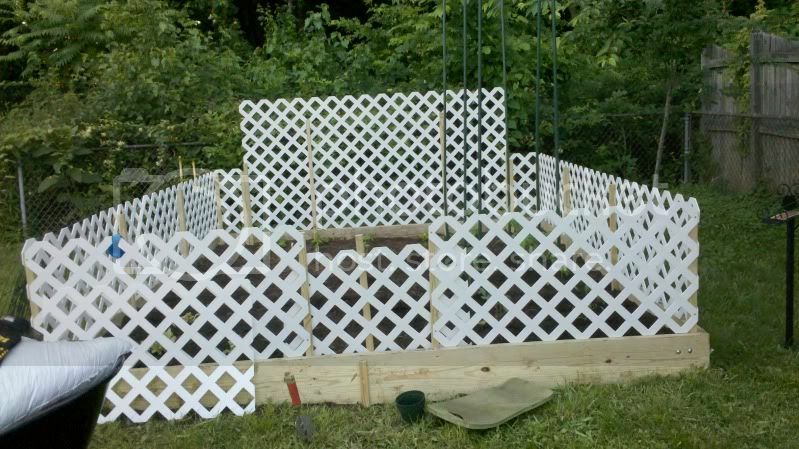 With the fence around the entire garden and the size of the raised beds, you will surely have to get in there at some point in time to tend to things. Yeah, I understand what your saying about the raised bed and I really didn't build it for that purpose but more for aesthetics. The lattices is to keep out critters and my two dogs that love to eat compost, pee on plants and just get dirty. I have a dense patch of woods behind my yard and there are a ton of fox, rabbits, squirrels and the like. So I guess I really just have a standard garden built up a bit. I was actually surprised at my soil when I tilled the yard as I am used to having a dense clay mix in my area but given that at one time my entire neighborhood was a farm this doesn't seem to be the case. Once I added my other soil it looked really nice as you mentioned. Hopefully I can keep my soil rich year after year. I have just started to dabble in composting at home so we will see. Now that I have some of my plants in the ground I started to wonder about my spacing and whether I was over/under planting. Basically I have more things to plant and the more and more I get going I think of other things I would like to get in the ground. So whats your thoughts? I have 6 bush variety garden bean plants to put in... Is that too many? I don't see any mention of your garden's square footage but by the pictures It looks about 200 sq. ft. or so. It seems to have good spacing but things like cucumbers take a good bit of room unless you allow them to climb on the fencing you have around the garden. It won't take them long to overtake that fence since it only appears to be around 36 inches tall. Broccoli get pretty large and so do tomato plants. 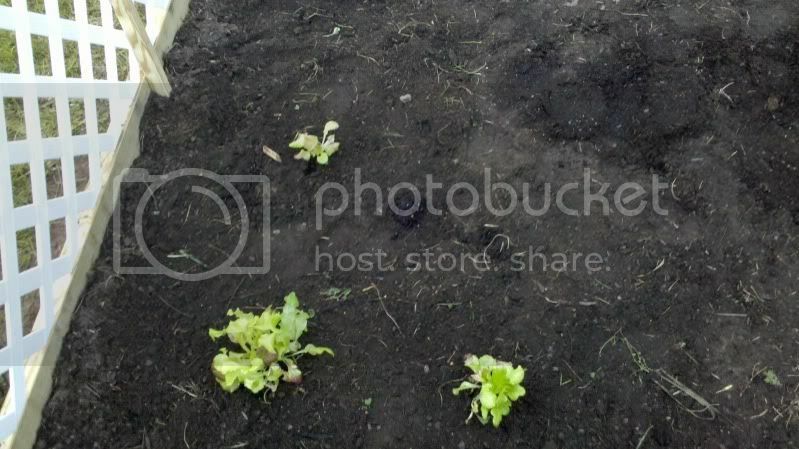 If you planted the lettuces between the tomato plants that would save some space and the tomato plants will help shade them. I can't grow lettuce in the summer down here in New Orleans because it is just too hot. Pepper plants don't get all that large and can be planted fairly close. I have mine planted in a 10 ft. part of a row about 24 inches wide and have them staggered in the row with one plant near one edge and the next near the other edge. This allows closer plant spacing in the row's length. Check out "Square Foot Gardening" techniques. Mel Bartholemew popularized that craze many years ago and many folks swear by it. My garden is 10' x 12' = 120sq ft. The cukes will be growing up the back of the gardens lattice which is about 4' 8" tall. The tomatoes are about 15"-18" on center. The Pepers are about 12" on center. 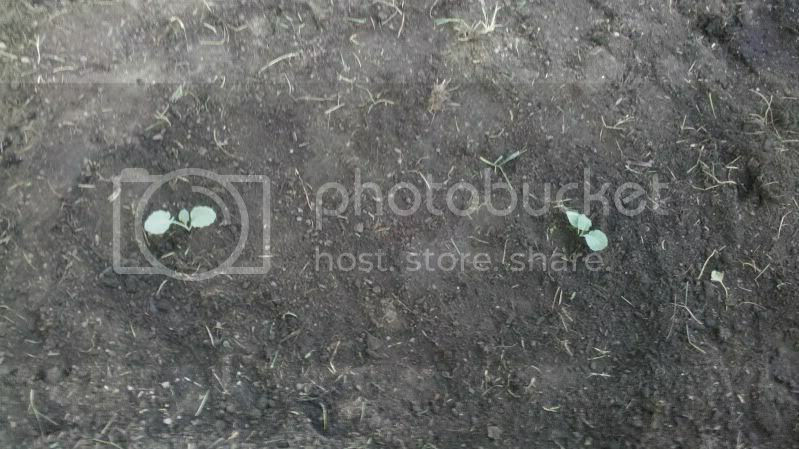 I left about 18 - 10" in between my broccoli plants and the cukes are spaced about 12" on center. The lettuce in between the tomatoes is an interesting idea. Do you think once the tomatoes are large and full it will shade the lettuce too much or is that ok for lettuce? Thanks for the advice and I will check out Square Foot Gardening. Keep us updated with pictures as things grow. 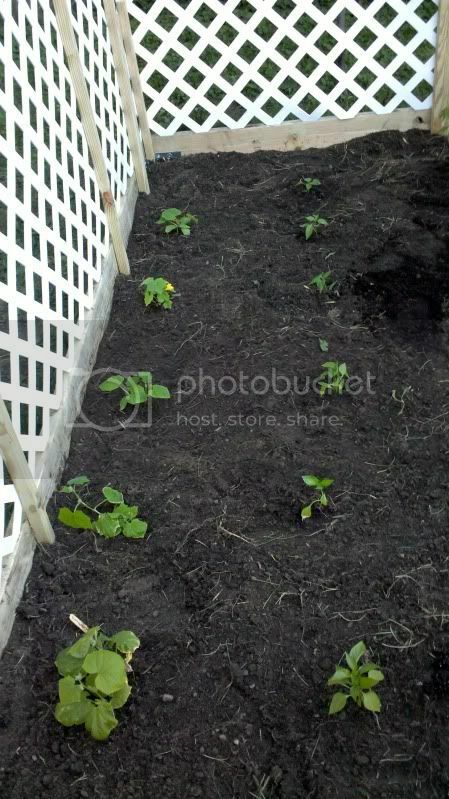 mbaker410 wrote: My garden is 10' x 12' = 120sq ft. I doubt the tomato plants will shade the lettuce enough to inhibit growth. Lots of folks use a shade cloth in warmer climates to get lettuce to last longer in the year when it starts to heat up a bit. If lettuce starts to bolt when your summer gets warmer, you may want to try some Swiss Chard. I'm a firm believer in chard as a spinach alternative that can tolerate a good amount of heat and still do well. Your cucumbers can be placed closer. I have mine about 6 inches apart and they are doing fine since the brunt of the foliage is on a trellis. My biggest issue now is with no rain. New Orleans has been under a long dry spell since January. By this time of year we usually average about 10 inches of rain but since Jan., we've had less than 1 inch of rainfall. Most things are struggling in my garden if not watered almost every day. It is so dry that the other night my wife and I went out to have dinner with friends and were gone over 3 hrs. I had put the sprinkler on about 1 hr. before we left and meant to turn it off but forgot. When we got home I turned the sprinkler off and there was no water puddling in my garden and that was after 4 hrs. of constant watering. Wow... That is a long time without rain. I am surprised that you guys aren't getting more rain that that now. Don't you normally get a decent amount of scattered rain storms and the such this time of year? We are currently in a dry spell as we haven't gotten any accumulation in over 2 weeks and before that we had rain all the time. There doesn't seem to be any rain in the forecast either so I guess its time for the soaker hose and timer. That is good to know about the cukes. I will probably move them closer or drop more plants in. We love cucumbers, especially my fiancÃƒÂ©. I might try planting some different varieties. This is my first time trying lettuce too so maybe I will go get some different lettuces and plant them in between my tomatoes. So do you think I can put different type of greens in between like collards, kale and spinach? I may put a mix of greens in if they will thrive being shaded. Also I have never done squash before but was wondering what kind of real estate they take up? Do you think I could drop some summer squash and zucchini in between my cukes? mbaker410 wrote: Also I have never done squash before but was wondering what kind of real estate they take up? Do you think I could drop some summer squash and zucchini in between my cukes? No, squash plants get HUGE. Before the Squash Vine Borers destroyed my plants a few weeks ago they were about 3 ft. tall and spread out about 5 ft. from the base in diameter. The leaves of zucchini plants can get about 1 ft. across each. mbaker410 wrote: Wow... That is a long time without rain. I am surprised that you guys aren't getting more rain that that now. Don't you normally get a decent amount of scattered rain storms and the such this time of year? Ironically, within an hour of posting that message, it started to rain and did so for about 90 minutes. My garden is happy and so am I since I won't have to water for several days if we don't get more. It is not unusual for New Orleans to get 3-4 days a week of afternoon rain of some sort during the summer months. Even with as little rainfall as we've had, the humidity is still pretty high. It gets even worse when we get the early afternoon showers and then the sun comes out and turns the city into one huge greenhouse. The funny thing is today is going to be 100 degrees and still no rain in sight. Well I think I have a good plan of attack now with your help. Once I get all my veggies going I will need to get a good Louisiana gumbo recipe from you! I would bribe you with Blue Crabs but I am pretty sure you have them down there too. mbaker410 wrote: Congrats on the Rain!!! I've already posted my Chicken/Sausage/Okra Gumbo recipe in the "Recipe" section of the forum. I did so sometime this past fall so it may take some looking to find it. A few folks have made it and I've gotten some positive feedback. I'll share my recipes for anything I cook, unlike some folks I know that will take theirs to the grave for one reason or another. Yep, we have Blue Crabs here. Matter of fact, I made almost 2 gallons of seafood gumbo just last week and used 4 blue crabs in it, along with shrimp, oysters and some small scallops. That definitely sounds good right now! I will look around for that recipe. Do you grow your own okra?